Man must evolve for all human conflict, a method which rejects revenge, aggression and retaliation. The foundation of such a method is love. What is conflict? Conflict means “discord of action, feeling, or effect; antagonism or opposition, as of interests or principles”, and an “incompatibility or interference, as of one idea, desire, event, or activity with another” (Dictionary.com). Other words for conflict include collision and opposition. Conflict often leads to a great deal of pain, leaving people wanting inner peace. Conflict can take place in interpersonal relationships within the family and in the outside world, and at various other levels, including intrapersonal conflict (conflict within the self), departmental, organizational, community-based, regional-based, national and international conflicts. 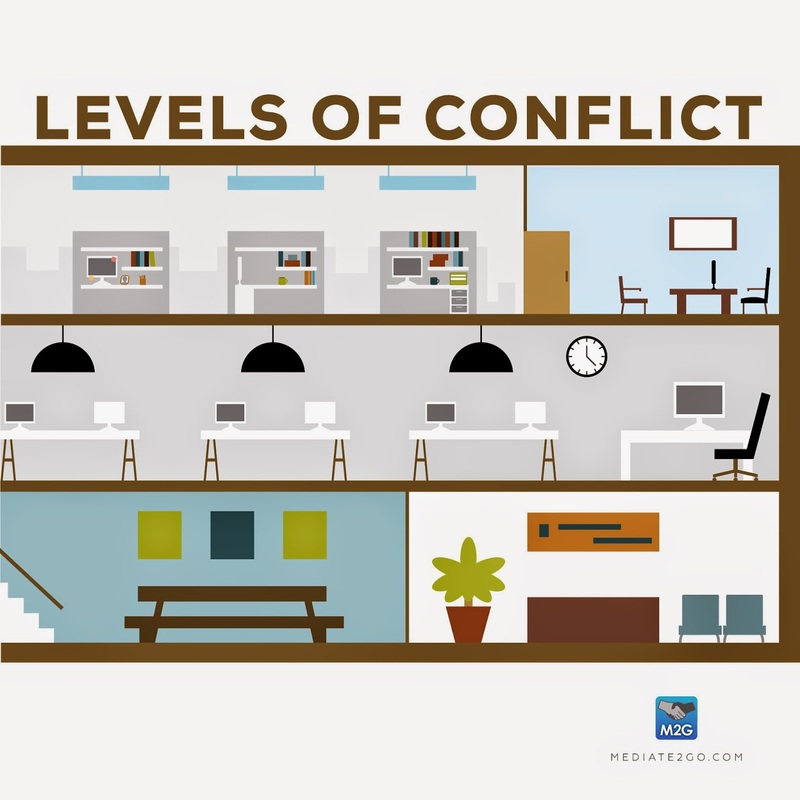 Often, conflicts take place at varying levels at the same time. For example, you might have a conflict at work with a colleague, but at the same time, the organization, by failing to address the issue right away, creates a conflict between yourself and the organization. Here are some examples of levels of conflict in an organizational setting. The most challenging part of conflict relates to conflict escalation. Typically, conflict escalates between parties so that issues become bigger than necessary, parties become increasingly angry with one another, they focus on blaming each other and issues become increasingly complex and difficult to resolve. Even if parties want to fix the relationship, it becomes increasingly difficult. In many areas of life, the traditional way of resolving an issue was to fight in court. Whether its divorce or a workplace dispute, parties would file a complaint or an action in court to address the issue. This type of approach, including labour arbitration, is adversarial, rights based and more formal. Parties ask a third party to make a decision, often leading to a win-lose situation. Read about the differences between mediation and arbitration. On the other hand, conflict resolution is now more about alternative dispute resolution, this means issues are addressed outside of formalized processes. Parties try to fix their relationship and resolve issues in a non-adversarial way, and only resort to a formal approach if the informal is unsuccessful. Don’t avoid the conflict. You might fear conflict and confrontation due to a fear of being rejected. Conflict can be positive for you, your relationships and your organization. Conflict can actually be good for business, leading to innovation. The key is to build your confidence to address the issue. Know that everything will work out. Manage your anger. Take some time to breath, relax and reflect, if you feel you might explode. Ideally, you bring up your feelings immediately in the situation, if you feel safe. However, there is nothing wrong with finding the right time to discuss an issue. This can reduce the likelihood of escalation. Reflect, don’t blame. We have the tendency to blame others. If you try hard, you can put yourself in the other’s shoes. What might they have felt in the situation? How would it have felt for them. It’s uncomfortable, but put time and effort into this. Don’t stay if it’s a destructive relationship. Is the conflict reoccurring? Think about whether the conflict is destructive. Sometimes we stay in destructive relationships, but no matter the resolution, it will be short lived without addressing the deeper issues. If you can’t decide if you should divorce or not, read about how to choose between mediation and therapy. Learn about negotiation and how to negotiate. Often, conflict resolution requires people to negotiate to ask what they are looking for. Use the Mediate to Go self-resolver to develop the right negotiation strategy for you. It’s free! Confront the person in a respectful way. We call this a constructive confrontation, where we prepare to discuss our concerns with someone in a respectful way, focusing on our feelings, not blaming the other. Take leadership in the situation. Become a self-leader in conflict resolution. To be a self-leader, you need to be powerful. Follow our LEADER acronym to address issues effectively to resolve conflicts in your life. Ask for help from a mediator or conflict coach. To find a mediator or conflict coach, look at the Mediate to Go mediation services directory. A conflict resolution expert can help you see things differently. 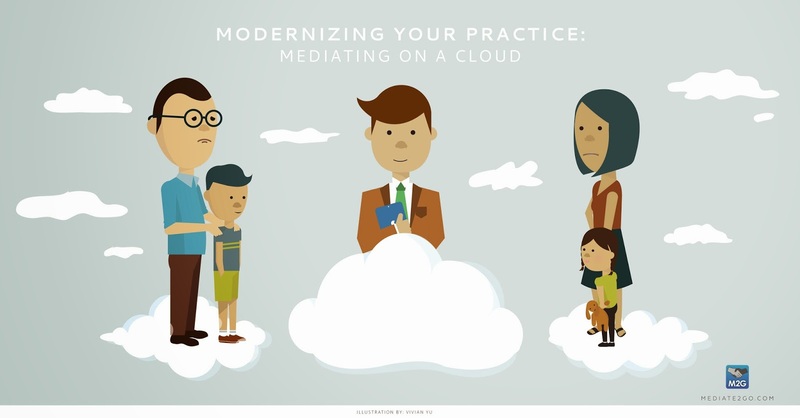 There are benefits to mediation services, so try it. 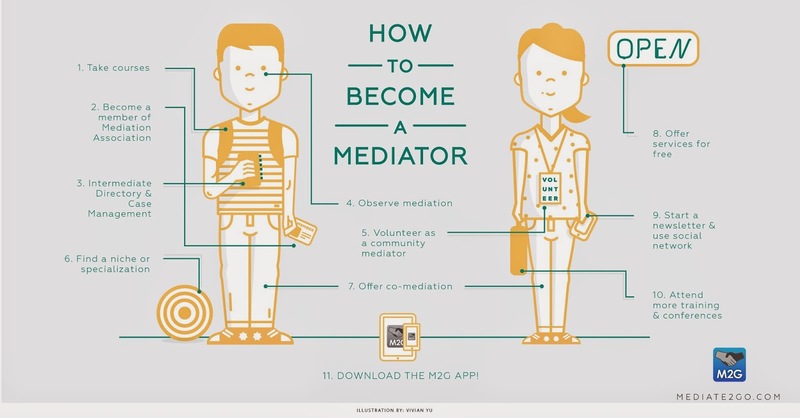 This is how you find a good mediator. Use the Mediate to Go Self-Resolver. We’ve developed an innovative tool to help people resolve conflict as recognized by McGill University Headway Magazine. Learn about conflict resolution and how to fix a relationship. Listen to our Top 10 songs about conflict to learn about typical types of conflict, and ways that people typically resolve issues. We have partnered up with leading mediation associations to ensure that our clients will be able to access trained professionals. Look for mediators on the Mediate to Go directory, and learn about professional standards on the following sites.